Generous giving - Generous receiving...... A morning of the Inver Grove Heights community coming TOGETHER to offer a helpful start to the school year to many in the community whether in receiving or giving... in the name of Jesus. This local Inver Grove Heights ecumenical ministry community event celebrates the gift of learning with food games, prizes and music for the IGH community. 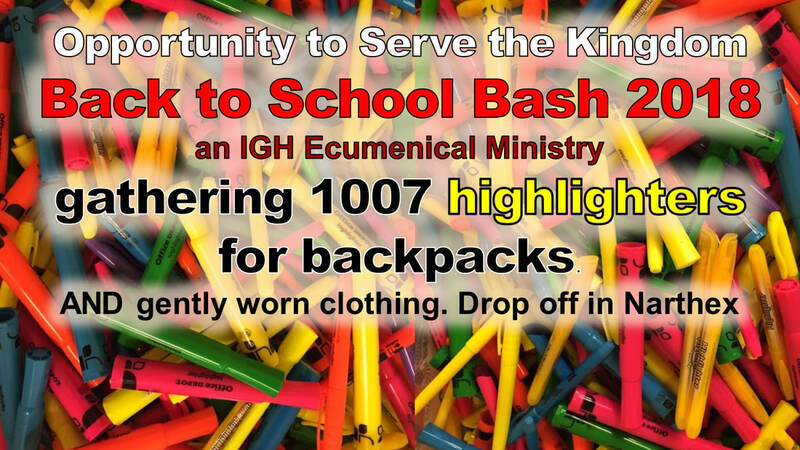 Also providing 1000 backpacks with school supplies to be given FREE to local elementary, middle school and high school kids in need. New and gently used clothing will be available too. No pre-registration. Backpacks will be distributed on first come first serve basis. ​Saturday, August 18th, 10:30am to 1pm at St. Patrick's Church. >> Click here to volunteer with others from the community to help host this family friendly, FREE event in our community. New Heights Community Church 302 Red pens, 1519 Blue pens, 1510 Black pens. NOW to Sunday, August 12th ALL are gathering gently worn, clean clothing for men, women, teen, children and babies for give away! At Mt Bethel, Drop donated supplies off in the cart in the back of the Sanctuary on Sunday mornings. Click here for more about our Inver Grove Heights Schools. K, 1st, 2nd: 2 Folders, 2 Wide Lined Notebooks, 1 Box Crayons, 1 Marker, 2 Pencils, 1 Glue Bottle, 2 Glue Sticks, 1 Pink Eraser, 1 Scissors. 3rd, 4th, 5th: 3 Folders, 2 Wide Lined Notebooks, 1 Package Wide Line Loose Leaf Paper, 1 Marker or Colored Pencils, 3 Pencils, 1 Red Pen, 1 Highlighter, 1 Glue Bottle or Glue Stick, 1 Pink Eraser. 6th, 7th, 8th: 3 Folders, 3 College Ruled Notebooks, 1 College Loose Leaf Paper, 1 Marker or Colored Pencils, 4 Pencils, 1 Red Pen, 2 Black or Blue Pens, 1 Highlighter, 1 Glue stick, 1 Pink Eraser.